Ghosts, skeletons, and cobwebs might be decorating the windows of shops these days, but why give in to fear when you can celebrate love in October? And why drown your sorrows and stress in beer at Oktoberfest when you can go on a rollercoaster of emotions at #FeelsFest? At least that’s what the folks from the #romanceclass community of authors and readers figure! 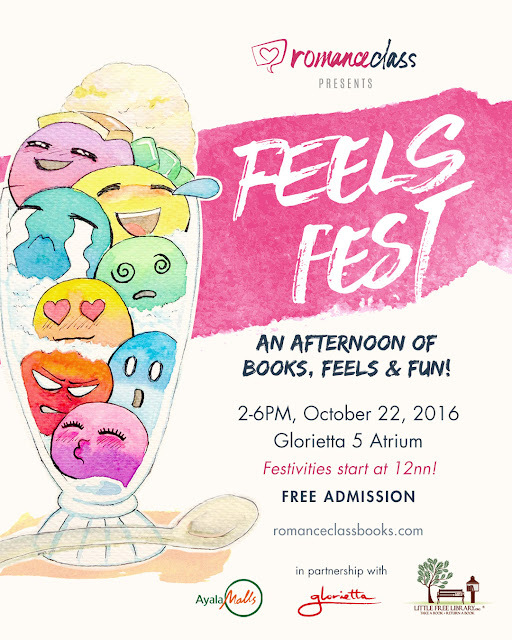 Mark your calendars: The #romanceclass #FeelsFest will be on October 22, 2016, at Glorietta 5 in Makati. Authors will be on hand to meet readers and sign books. They’ll be selling indie romance books—many of which you won’t find in your typical bookstore. There will also be games, giveaways, the launching of over 15 new titles published by indie authors just this month, a book donation drive for Ayala Malls’ Little Free Library, and the much-anticipated live readings! In fact, #romanceclass live readings are show stealers, thanks to the feels delivered by actors invited to read excerpts from romance novels. Previous live readings have been punctuated with shrieks and sighs. #FeelsFest will mark the fifth official live reading event, the last one held just last month at the Manila International Book Fair. #FeelsFest will feature new live readings from #romanceclass books. Visit http://romancepodcast.com/ to get the audio versions. The #FeelsFest live readings will feature performances by Gio Gahol, Rachel Coates, Hervin Alvarez, and Gabriela Pangilinan. Expect to hear scenes from books by Mina V. Esguerra, Ines Bautista-Yao, and more. “The #romanceclass community is all about encouraging each other to read, write, and publish books we love,” says author Mina V. Esguerra, whose books include Tempting Victoria, What You Wanted, and Iris After the Incident, all of which and more will be available for sale at the event. “#FeelsFest is our chance to give back to the community of readers and friends who’ve supported us. We get to have a little fun, and maybe meet some new people who love a good love story as much as we do.” So if you like to hug your hugot close and are addicted to happy endings, drop by Glorietta 5 on October 22. Selling will begin when the mall opens, and the official program is scheduled for 2PM to 6PM. For more information about #romanceclass, visit http://romanceclassbooks.com, where you’ll see a catalogue of the authors’ books along with other information about the community. #FeelsFest is brought to you by Ayala Malls.